With more than 35 tax attorneys, with an average of more than 20 years of experience each, Sullivan & Worcester's tax practice is one of the largest on the East Coast. Our size and national reputation reflect a commitment to quality, an ability to design creative solutions to complex problems and the insight to understand and achieve clients' goals. Our tax attorneys can address the entire spectrum of tax-related legal problems, from tax planning for complex corporate reorganizations to representing clients in adversarial proceedings with the Internal Revenue Service and state tax authorities. Our International Tax practice is highly regarded for its expertise in international taxation, both in terms of advising U.S. clients on foreign investments and counseling foreign investors in the tax implications of their investments in the United States. 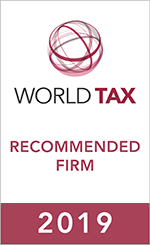 The legal practice of many of our tax lawyers includes a significant international tax planning component, and four of our lawyers focus primarily on international taxation. We also represent clients in conflicts with the Internal Revenue Service and state tax authorities, and we are particularly recognized as a leader at resolving Massachusetts state tax controversies for both individuals and businesses. We manage all stages of tax disputes, including audits, administrative appeals and litigation. When the stakes are high and the law is unclear, we obtain private rulings from the Internal Revenue Service and state tax authorities for our clients.